Glentoran manager Gary Haveron found out on Saturday that football can be a cruel game as his Glens lost 3-2 to Ballymena United at the Oval. It had looked so good for Haveron’s side as they went in at the break 2-0 up but United - to their credit - never gave up and scrambled back to win 3-2 thanks to an injury time winner from Johnny McMurray to send the Glens to a home defeat that had not looked on the cards. It will have been a wake-up call to Haveron’s troops and the manager did nod back in his post match summary. “That is not acceptable. Not acceptable to me and the fans going home booed us off at the end and rightly so for that second half performance. It was not good enough. “Maybe it is a reality check of where we are at for some of them. Maybe some of them think they have done enough? “I don’t know, they have worked really hard over the last ten to 11 games. Maybe they had thought they had done enough? Maybe they had thought the game was over at half-time? I don’t know? “I knew we were in a very tough game and we allowed them back in it during the second half. “And from managing the game in the first half, our second half game management was terrible. “We were awful. Our energy was poor, our discipline was poor, our defending was awful. Our decision making was awful. “But at the end of the day maybe we have over achieved the last number of weeks and maybe we need to go back to basics and they will know all about it in training this week. “They will train Monday, Tuesday and Thursday this week and they will have to knuckle down as that was not good enough,” he added. The afternoon had started so brightly for the Glens as they were was 1-0 up in the 10th minute as Chris Lavery’s cross from the left was deflected into his own goal by Ballymena defender Adam McCracken. The defender was unlucky as he was just in the wrong place at the wrong time. 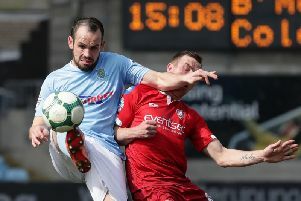 The home side extended their lead in the 26th minute as Stephen McAlorum’s effort somehow beat Ross Glendinning in the United goal. It could have been 3-0 ten minutes before the break. A Ross Redman cross found Curtis Allen but his shot was well saved by Glendinning. It was 2-1 in the 50th minute as Cathair Friel went on a 40 yard run before feeding the ball through to Fra McCaffery and he fired home past Eliott Morris. It was a good finish from the former Glens midfielder and it was his third goal in two matches. It was then 2-2 in the 85th minute as McMurray’s cross was headed across goal by Willie Faulkner before it fell to Tony Kane and he fired home from close range. Then just as the Glens thought their afternoon could not get any worse - United got the winner through McMurray in the 91st minute as the striker rifled home as the shouts of discontent started from the Glentoran faithful. And Ballymena manager David Jeffrey still believed his side could get something from the game even when they trailed 2-0 at the break. “I did. I told them at half-time they did not deserve to be 2-0 down.